We are pasta eaters in our house. That fact is not amazing for my waistline but it does open an endless list of possibilities for recipes that range from extremely complicated to utterly simple. 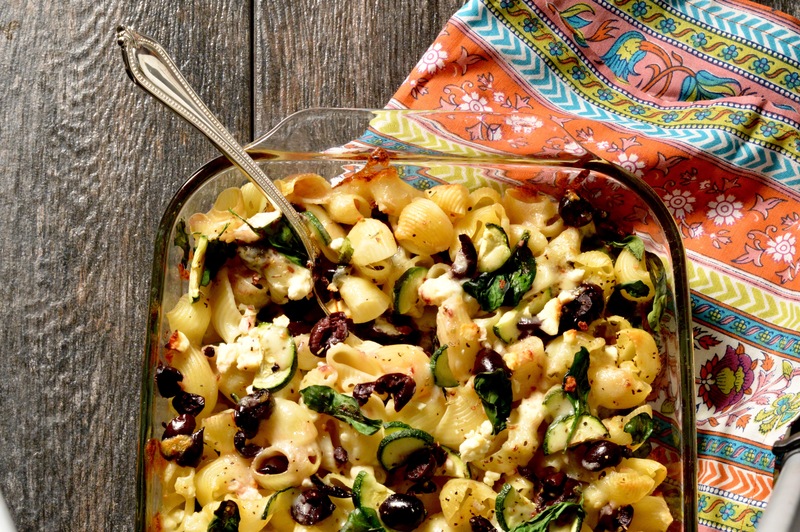 This casserole falls into the simple category. It can be made ahead and baked at the last minute as well! Perfect for a pot luck or to make on Sunday as your Mindful Monday quick and healthy dinner fix. I decided to make this meat free. I wanted to be somewhat calorically responsible, to use fresh ingredients and I opted for cheese over meat. That being said, if you want to add meat, dice some cooked chicken breasts into one inch cubes and add them to the top of layer one. I would also like to add, this meal can be made in about 35 minutes total. Fifteen minutes prep and twenty to bake. So, there is no excuse to get fast food! With a little planning and in little time, you can have a healthy and delicious meal. • 1 lb pasta. You can use anything but, I would suggest a shell or penne. Something with some crevices to catch the goodness. 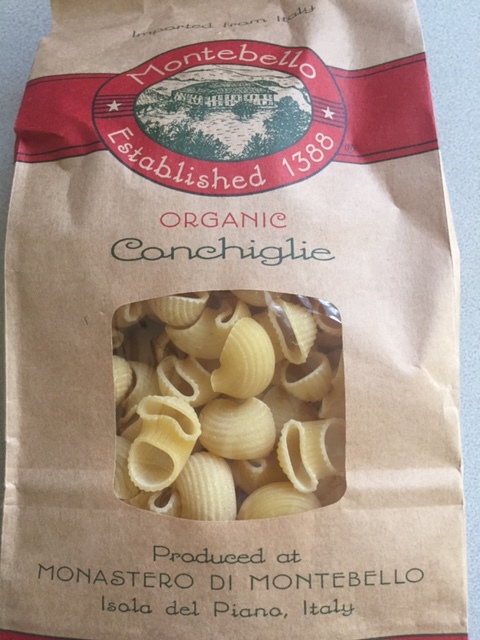 I used Conchiglie, named for the conch shell that it mimics. 1. Set your water to boil and your oven to 400 degrees. Cook pasta according to package directions. Chop olives, grate cheese and slice zucchini while waiting. 2. 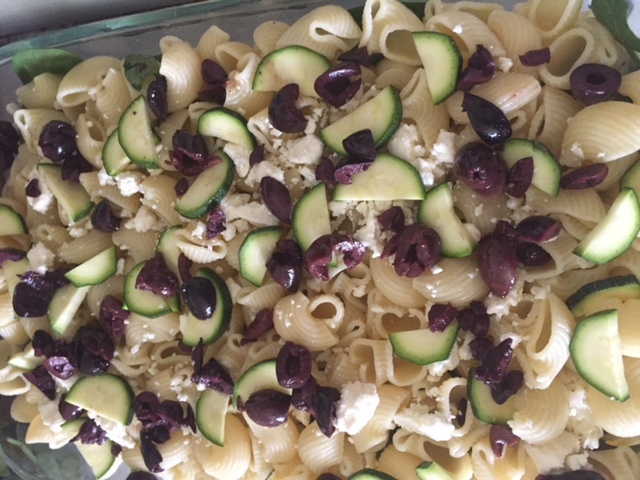 Once pasta is aldente, drain and pour half into a greased 9×13 baking dish. 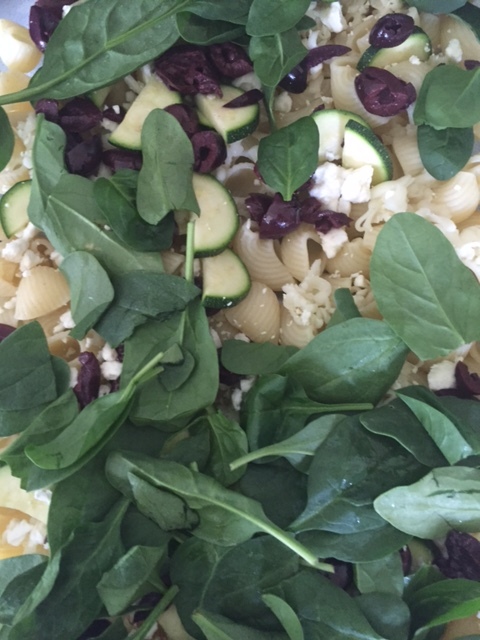 Top that with half of each cheese, half of the zucchini, half of the olives and 1.5 cups of the spinach. 3. Repeat the layers, top with remaining spinach and drizzle with olive oil and the reserved Calamata olive liquid. Pepper to taste between each layer. I also used a rustic Tuscan seasoning blend by Old Thompson (Thanks AMY) but a sprinkle of Italian seasoning would be fine. 4. Cover with foil and bake for 10 minutes, remove foil and cook for remaining 10 minuutes or until cheese is melted and the egdes become golden and crisp. Serve immediately and enjoy! I made this deliciousness for my girlfriends the other night and it was lovely. Totally low maintenance and hassle free. Try it out and let me know how you like it or if you made any modifications that you enjoyed. Swearing Mom out. 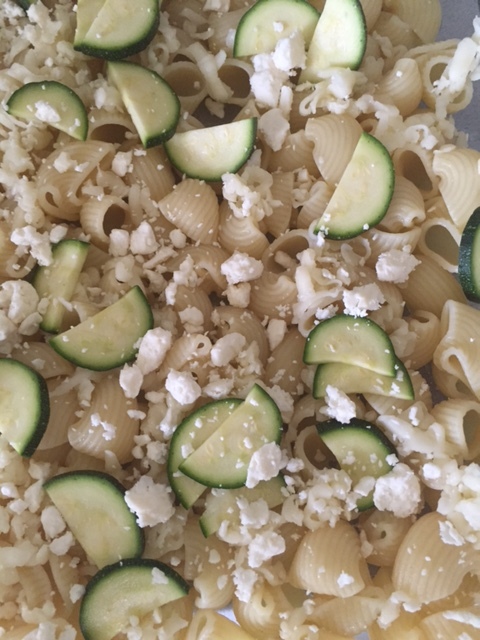 First layer of pasta, both cheeses and zucchini. 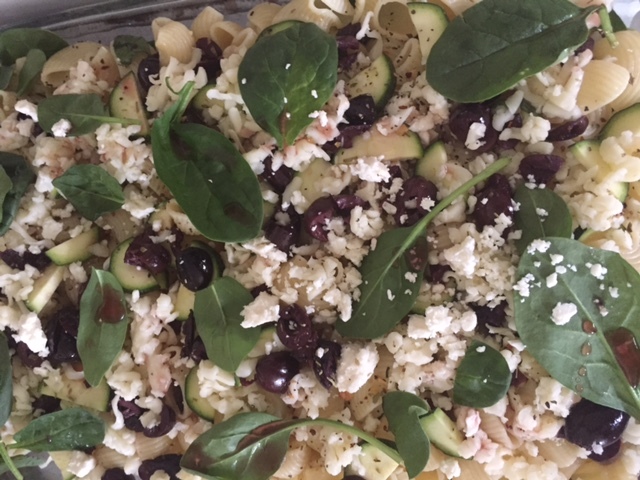 Add the delicious olives… perfectly salty with the feta. No additional salt needed. Be generous with the spinach. It will get much smaller once cooked. Final layer… A bit less spinach allows everything else to peek through for a lovely presentation.